A recent fatal car accident in Brockton brought to light another consequence of the opioid epidemic that has affected our state. In the late morning hours, a 29-year man from Whitman was traveling with his 7-year old son when he attempted to drive around a vehicle in front of him that had moved to an adjoining lane to allow him to pass. Instead of staying within his lane of travel, the man swung his car into the opposite or southbound lane of Bedford Street in Bridgewater, striking head-on a Brockton man who was on a motorcycle. The victim was rushed to a nearby hospital in Brockton but succumbed to his severe injuries. An investigating officer at the scene noticed that the vehicle driver was showing signs of drug impairment. After the man failed a number of field sobriety tests, he was placed under arrest for vehicular homicide in addition to other charges including endangering a child while operating under the influence of drugs. The defendant’s attorney claimed that a malfunctioning car hood had obscured the man’s vision in the moments before the accident. The defendant’s criminal history listed 27 convictions, 45 violations of probation, and a 2015 conviction for possession of heroin. Brockton is not immune to the nationwide crisis of opioid addiction that can lead to fatal car accidents when someone under the influence attempts to drive. Brockton is a city of 95,000 people and lies about 24 miles south of Boston in Plymouth County and has been referred to as the City of Champions, being home to former boxers Marvin Hagler and Rocky Marciano. Head-on collisions are not a common occurrence, but they are among the most deadly of motor vehicle accidents. Many such incidents, similar to the one that took the life of the Brockton head-on collision victim, occur when a vehicle enters the opposite lane of traffic and meets another vehicle front-on. Although an airbag will usually deploy, a motorcyclist has no such protection. Even with an airbag, a high-speed collision can easily result in catastrophic or fatal injuries to the drivers and passengers. Cities and states have attempted preventative measures to keep drivers within their own lanes and awake while driving such as rumble strips or medians to prevent cars from crossing over to the opposite lanes of travel. In most head-on collisions, liability is apparent. Head-on accidents occur when distracted drivers loose control, when a motorist misses a sign and drives the wrong way on a one-way street, when the driver falls asleep or tries to avoid rear-ending a vehicle by swerving into the opposite lane of travel that has no median separating the directions of travel. In the Brocton head-on collision noted above, the driver claimed that his car hood had malfunctioned, intimating that it came up and blocked his vision, causing him to lose control and that his apparent physical condition allegedly impaired by drugs was not the cause of the fatal accident. Video surveillance of the accident was obtained that showed the defendant moving into the opposite lane of traffic but news reports did not indicate whether the vehicle’s hood had popped open just prior to his losing control. If the hood had been malfunctioning before the accident, the defendant’s prior awareness of this should have alerted him to the dangers of driving. His continuing to drive despite this knowledge was negligent at least since it was foreseeable that the hood would pop while driving and obscure his vision, increasing the risk of an accident. His hood malfunctioning would nevertheless not cause him to switch lanes. Otherwise, his ingestion of drugs that impaired his judgment and driving conduct is gross negligence. Because a fatality occurred, punitive damages could be imposed by a jury. If a defect in the vehicle caused a motorist to lose control, then the manufacturer of the vehicle or of the particular item, such as a defective tire, could be held liable. If a service technician failed to repair a faulty steering system or hood that popped up without warning, then the service station could be held responsible. In some cases where roadways experience a high volume of cars crossing into the opposite lanes of traffic, the failure to construct a median or other preventative measure could impose liability on the municipality responsible for designing and/or maintaining the roadway. 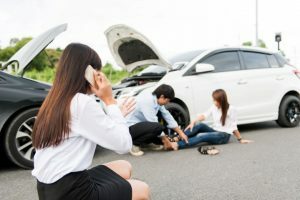 Punitive damages may be no less than $5000, but they must be recovered from the individual personally since auto liability insurance does not cover such damages. If you or a loved one was injured or died in a Brockton head-on collision, or in any other location in Massachusetts, you will need the services of injury lawyers from the Law Offices of Burns and Jain. Our lawyers handle the most complex cases and have obtained millions of dollars for injured clients and their families over many years of representing individuals and families. Whether liability is clear or not, you will want the best opportunity to obtain the most compensation for your damages. Call Massachusetts Attorneys Neil Burns and Roshan Jain today at (617) 227-7423 for a free consultation.